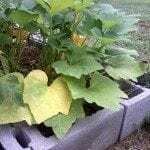 I am growing yellow squash. The squash will get 3 to 4 inches long and that is it. I have picked them and figured next ones will be bigger. Now they get about that size and start rotting. Why? They never get bigger than that.